Kate Middleton Is “Back to Work” After Luxury Vacation – What A Joke! Kate Middleton’s baby bump will be on “proper” display when she officially goes “back to work” tomorrow – whatever, if “work” means: smiling pretty for the photogs, flipping your hair and showing off your engagement ring all while pretending to care about the less fortunate people who benefit from the charities you’re visiting. The Palace PR spin doctors know that Kate’s image is in dire need of rehab, after she and hubby Prince William were spotted on the uber expensive and exclusive Carribbean island of Mustique last week. Nice move in these times of austerity, guys. We’re in this together – yeah, right. Clearly, the palace PR goons have been reading the negative comments about the royal couple splashed all over the blogosphere (just check out the seething comments in the Daily Mail). So they thought it would be a good idea to send Kate to a highly deprived, hopeless place and not some cushy assignment like a movie premiere or a gallery opening. This way, no one will dare criticize “Her Royal Holiness” and her lack of responsibility and work ethic. That tiara came with a job, Kate, just sayin’. After her little visit to Hope House on Tuesday – a residential rehab center for women where poor Kate won’t have any men to flirt with – she’s now going to be visiting a whole 3 other places! But not right away. No, of course not. Kate needs a break, after all. Some time spent shopping, getting her hair done, massages… I mean, a girl needs some serious R&R after conversing with commoners. So, fast forward to March 5th, when Kate’s off on a “royal away day” to visit the run down town of Grimsby. There she’ll learn all about the town’s fishing heritage, meet fire and rescue workers and talk to the photography class at a local school. 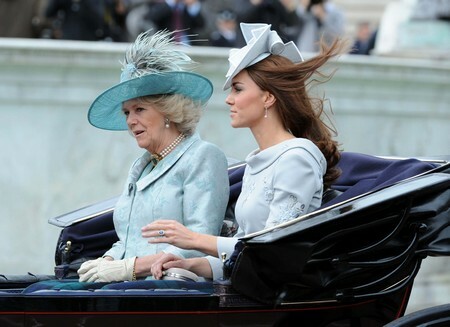 Kate’s thrilled, I’m sure. What’s the betting she’ll come down with a severe case of HG before her trip to Grimsby and will have to cancel? Even if she doesn’t cancel, it’s a sure bet she and hubby Wilbur will be jetting off to the French Alps so Kate can get some much needed holiday time after visiting the unwashed masses. The palace PR machine has some nerve, as do Willy and Waity. Do they really think the public is so stupid as to swallow this piece of blatant PR B.S.? I wonder how the people of Grimsby, and indeed Hope House, will react to Kate’s Mustique suntan as she smiles patronizingly at them while flipping her hair and showing off her dazzling ring, making sure it catches the light for the cameras. Better keep your protection officers close by, Kate, just sayin’. Kate Middleton and Prince William Need a Break From Tough Royal Life — Jet Set to the Caribbean!